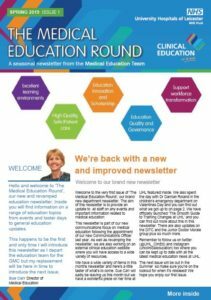 We can now reveal our new and improved Clinical Education Newsletter! Our Spring newsletter is out now and can be downloaded here Clinical Education Newsletter – Spring. Keep an eye out for our Summer newsletter which will be released in July! This newsletter contains a special piece about our Director of Medical Education Sue Carr as she leaves us for the GMC this month.